The first five designated ports – Canton, Shanghai, Amoy, Foochow and Ningpo – all lay along China’s south-east coast. The first British consulate to be established in China was at Canton in 1843, and space for it was leased in a comfortable Western building close to the Thirteen Factories. Another was established in the same year at Shanghai, where the first British consul, George Balfour, laid out the infrastructure that quickly became the concession, or settlement, area for development by the trading companies. In 1846, Balfour leased from the Chinese government a further 15 acres as the site for a consulate, between the foreign settlement and Soochow Creek to its north. A consul’s residence, including his office, was completed on this site in 1849, designed and built under the direction of George Cleverly, the second surveyor-general at Hong Kong. It was followed by two houses for vice-consuls and a small gaol. James Bruce, 8th Earl of Elgin and High Commissioner to China at the time, wrote of the consul’s residence in March 1858 ‘… a very spacious mansion. The climate, character of the rooms etc. make me feel in Europe again’. Trade prospered at Canton and Shanghai but languished at the other three ports. 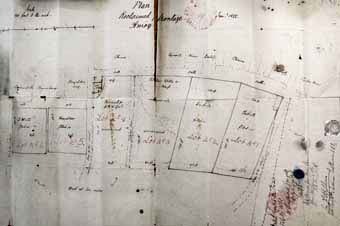 A small concession area, including a lot for a future consulate, at Amoy was negotiated in 1852 by a young Harry Parkes but was developed only slowly. Without much trade at a port, it was impossible to justify capital expenditure on a consulate building, and the consuls had to manage as best they could the daunting task of finding somewhere to live, and to call a consulate, in towns that were unwelcoming, unhealthy and unsafe. Most of the consuls managed to find something to rent, however unsatisfactory: others could do no better than establish their consulates in boats moored at the water’s edge. The toll on their health was very heavy: of the first 85 consuls appointed to China, about a third died in harness and another third was retired for reasons of ill-health (which included dismissal for mental derangement). More than half in each category was aged less than 40. The Second Opium War began in 1856: British and French troops seized Canton and the Thirteen Factories were burned down. The consulate, under Parkes, took to boats for a while and then withdrew to Hong Kong. China refused to ratify the 1858 Treaty of Tientsin and hostilities resumed in 1860. British and French troops took Tientsin, occupied Peking and burned down the Imperial Summer Palace. The subsequent Peking Convention of 1860 ratified the 1858 treaty and imposed the right of Western diplomatic, as distinct from consular, representation in the capital. A compound for the British legation was leased in the centre of Peking (and was occupied until 1959), and responsibility for the British consulates in China passed from the Superintendent of Trade in Hong Kong to the minister in the Peking legation. Parkes, returned to Canton in 1858 as the effective leader of a European commission to govern the city. In this capacity, he embarked on a huge project for a concession area that would be safer for future trading than the Thirteen Factories site. It entailed reclaiming land around a large sandbank that lay close to the north bank of the river: the work, including protecting the reclamation with solid masonry embankments, took two years. The new Shameen Island, 875 metres long and 300 metres wide was separated from the Chinese city by a canalised creek, crossed by a gated bridge at either end. Since the British had funded 80% of the infrastructure costs and the French 20%, the island was divided between their two concessions in the same proportion, giving the British about 44 acres at the western end. Parkes divided this area into 80 lots and auctioned most of them to trading companies, but allocating six lots in the middle, comprising nearly two acres, to a future British consulate. Charles Cleverly, still surveyor-general in Hong Kong, oversaw the design and construction of three substantial consular houses ranged round this site: one for the consul, vice-consul and three assistants; one for offices; and one for a constable’s quarters and gaol. These buildings were completed in the early 1860s. The Treaty of Tientsin designated nine more ports that were to be opened for trade. Their selection illustrated the widening and deepening of the penetration of trade into China. Swatow was close to the existing five ports, but Chinkiang, Hankow and Kiukiang were river ports on the lower Yangtze. Parkes, who had been seized by the Chinese and briefly imprisoned in Peking in 1860, took great pride in negotiating concession area leases for all three in 1861. Tientsin, Chefoo and Newchwang were in the north, Anping was on Taiwan, and Kiungchow on Hainan Island in the south. Besides Canton, two other consulate developments, both purchases of new buildings, took place in the first few years after the Second Opium War. One was the purchase at Amoy from Tait and Co. in 1862 of a 6½ acre compound on the south-west of Kulangso Island. The compound, well timbered and stretching down to the beach, contained two recently built houses well suited for the consul and the assistant. The other was the purchase at Swatow, from an enterprising United States vice-consul in 1863, of a 1½ acre compound on the Bund on the south bank of the river. It contained a large recently built house that was converted to accommodate the consul, an assistant and consular offices. A constable’s quarter and gaol were built nearby two years later. By 1865, the realisation was dawning on London that the provision of passably healthy, safe and effective accommodation for consuls and their families in China and the Far East was going to be a very expensive business. It looked as if the British government was going to have to fund the acquisition of land and the construction of permanent buildings. The Treasury began, in the early 1860s, to allocate money direct to the consuls for acquiring their premises but mis-spending was widespread (and included the unauthorised sale of half of the Shanghai compound). 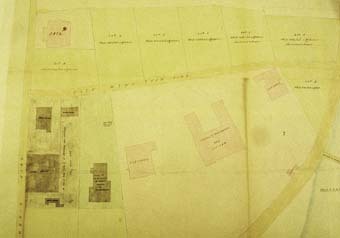 Plan of the small concession area comprising six lots on the reclaimed frontage at Amoy, drawn in 1855. Lot 4, one of two that had not yet been reclaimed, was reserved for the British government should it be required for a consulate building (which it never was). The Custom House was on the right at the rear. The large house at Swatow, built in the 1850s, bought by the British government in 1863, and converted into the consulate, with its offices in the single-storey wing.